Baby, Baby, What Do You See? Here's your child's chance to save the day! 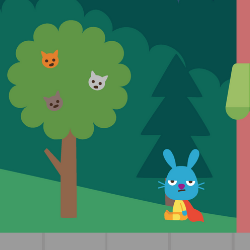 In classic Sago Mini style, help Jack fly around the city and be a superhero. Rescue a citizen from a burning building, discover a tree-nomming yeti, placate an ice cream-loving octopus and more. There are lots of surprises to find in the city! Children will love to see the little ways Jack makes his city better. At the same time, they'll strengthen their fine motor skills! Sago Mini Superheroopens a new window is available on Appleopens a new window devices, Androidopens a new window and Windowsopens a new window mobile devices for $3.99. *Remember, as with all media, it's best if you and your child play together. The American Pediatrics Association recommends that children ages 2 to 5 have a trusted adult to relate what they're seeing to the world around them. They also suggest that screen time be limited to one hour a day for this age group. For more information, take a look at their recommendations for media usageopens a new window.